This piece is on loan from the artist - the Trust owns another of Davies' works which is also located in Thorpe Meadows, just across the river. Both works are made in the same way cut out from plate steel using lasers in a water tank. The precise construction makes for an intricate working of the steel. The surface constantly oxidising to an autumnal glow. Davies studied at Brighton Polytechnic 1978-81 and then at Manchester Metropolitan University with a Henry Moore Fellowship 1992-93. 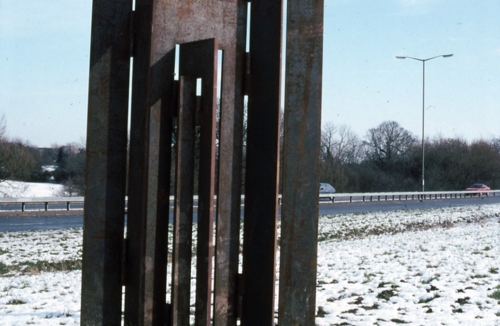 He has shown widely across Europe and has works in a number of sculpture parks in the UK.